This week is relatively light on movie-related events, but there's still a lot of good stuff including my pick of the week. But if this isn't up your alley, you might want to stay outdoors while the weather is not terrible. Alamo Drafthouse: PICK OF THE WEEK! Since today is THAT day celebrating mispronunciation of numbers and STAR WARS, it's only apt that today there's be a screening of director Kyle Newman's ode to Star Wars fandom, FANBOYS. 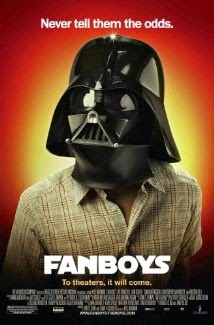 For those not hip to it, it deals with a group of friends trying to sneak into Skywalker Ranch so their terminally-ill friend can watch THE PHANTOM MENACE. The fun begins at 7:30 pm. Texas Theatre: The very free and very cool Tuesday Night Trash returns with 1989's WITCHTRAP. Alamo Drafthouse: As the release of PITCH PERFECT 2 looms in the near future, it feels fitting to attend aca-awesome the Action Pack sing-along of PITCH PERFECT at 7:30 pm. Alamo Drafthouse: As Jonesy can attest, the Drafthouse sing-alongs are awesome times especially if you're into the theme of the sing-along. Given the audience for this here blog, I imagine a lot of you would be into the 80's Movie Anthem sing-along at 8:55 pm. But if shaken and stirred is more up your alley, why not come in at 7:30 pm and check out the next installment of the Bondthology series: GOLDENEYE. This might come as a shock to a lot of people, but it's not just the greatest N64 game of all time; it's an actual movie! And the best one of the Brosnan era. Alamo Drafthouse: I'm truly not a fan of musicals for the most part. I have been known to love a few but those are the best of the best of the genre. So it might be a bit of a surprise that I actually dug the Bee-Gees musical, MAMMA MIA! There will be a 4:00 pm sing-along, and I imagine your mom will absolutely love going. And in a more twisted Mother's Day shout-out, there's a 1 pm screening of PSYCHO. Granada Theater: Another fun double feature starting at 2:00 pm with DIRTY DANCING, followed by the vampire classic, THE LOST BOYS. Both shows are $3 each along with some drink specials.